Two of the most photographed buildings in Montana include Gillian Hall on the left and the Fraternity hall on the right. Both buildings form Montana’s smallest state park today. Photo Kathy Weiser-Alexander, 2008. Ghost towns, from mining camps to windblown prairie farms and settlements, hide tales of days gone by throughout the Old West. Forgotten hamlets and abandoned villages abound throughout America, but the rapid nature of settlement and migration throughout the West make the region a treasure trove of these shadows of the past. More and more enthusiasts of the history of the region make it their business to explore these lost bits of life in the 1800s and early 1900s. The ghost towns tell tales not often found in today’s growing Western towns and cities. 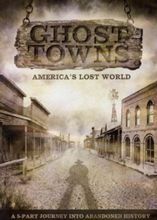 During it’s heyday, the West rarely used the term “ghost town” to describe itself — these were growing settlements and camps of emigrants coming westward for a multitude of reasons. Those placed known now as ghost towns were often boom towns back then. Ghost towns became best known, with that term being used for them, in the 20th Century, chiefly referring to abandoned mining camps and mining towns. Those communities came into being mostly in “boom” fashion as people flocked to the gold fields and crowded into gulches around streams to pan for gold or silver. When the precious metals were gone, or if a disaster such as fire or flood struck, the towns were gone. In other cases, ghost towns came about because small towns or villages were hit by long term droughts, or simply wore out their resources — or people just decided to move on looking for better living conditions. Such towns and deserted ruins of towns are located throughout the West, many of them in the mountains or on rivers and streams where they reached the Plains near mountain ranges — that’s where the gold was. 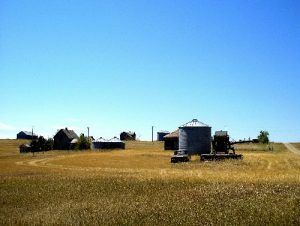 There also are small farming communities that have become ghost towns. Closely related, there are many homesteads and farms with ruins that can be explored for a glimpse of everyday life in the 1800’s. (If you find and choose to explore any abandoned town or farm, be mindful of private property and property rights that might apply.) My own grandparents and some great-uncles and great-aunts homesteaded land in the southeastern corner of Colorado. As a child, I can remember being taken by my parents to see the old homestead, which included a sod house and barn which were still standing from the early 1900’s. Ghost towns and old farmsteads hold a great fascination for hikers, campers, and other adventuresome tourists in the West. Some of these towns have been revived as travel destinations, with restored 19th Century buildings and show places. Central City, Cripple Creek, Black Hawk, and other towns in Colorado thrive as tourist destinations, making great profits and reviving as towns because of their efforts to connect with their colorful pasts. Still other mining camps and villages went through the boom and bust cycles of the region but maintained their populations and identities up to the present. Instead of becoming ghost towns, places like Leadville, Colorado, and other towns had the resources and transportation (railroads, freight lines, highways, etc.) it took to thrive as contemporary mountain and desert towns. 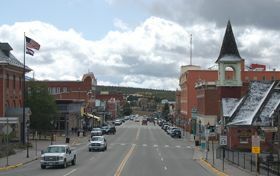 Leadville, for example, was founded as a silver and lead mining boom town; millions of dollars and famous mining moguls rose and fell in the town’s past. Yet today, Leadville is a thriving town of some 2,200 people. It offers all the fun and history of a mining and “Wild West” town without so much of the glitzy tourism — it remains a real place, and is by no means a ghost town. 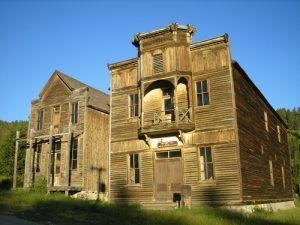 If you have the opportunity and time for it, you can spend many a fascinating vacation roaming through the treasures and history of ghost towns of America which abound throughout the West. Take a trip and see for yourself. Let these places reveal their hidden tales of the Old West to you!. About the Author: Gary Speer is a longtime writer and former newspaper copy editor who focuses on writing tips, Internet marketing, blogging, and a variety of topics related to outdoor living, collecting, and lots of fun things!